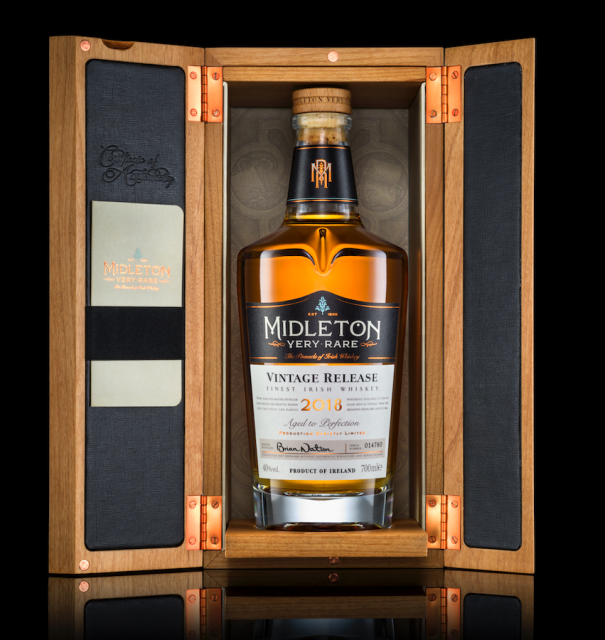 Irish Distillers has released the 2018 edition of its Midleton Very Rare whiskey marking the 35th anniversary of the range which was first unveiled in 1984. Midleton Very Rare 2018 is a blend of single pot still and single grain Irish whiskeys selected by master distiller Brian Nation. Each cask has been matured in lightly charred ex-Bourbon barrels for between 12 and 28 years. According to Irish Distillers, the 2018 edition has a “subtle floral note alongside a hint of fresh herbs and citrus…complemented by the spicier characteristics of cinnamon, clove and black pepper”. The whiskey is bottled at 40% ABV and available for an RRP of €180 in markets including Ireland, the UK and the US. Brian Nation, master distiller at Midleton Distillery, commented: “It is a great honour to have my signature on the front of each bottle of Midleton Very Rare, and this acts as the ultimate guarantee of quality from the Midleton Distillery. “We set aside very small amounts of particularly fine single pot still and single grain distillates each year so that the Midleton Very Rare legacy can continue. “This practice has been going on for over 40 years and today we are the proud custodians of the exceptional distillates with a duty of care to ensure that future generations are able to enjoy the pinnacle of Irish whiskey as we do today”.